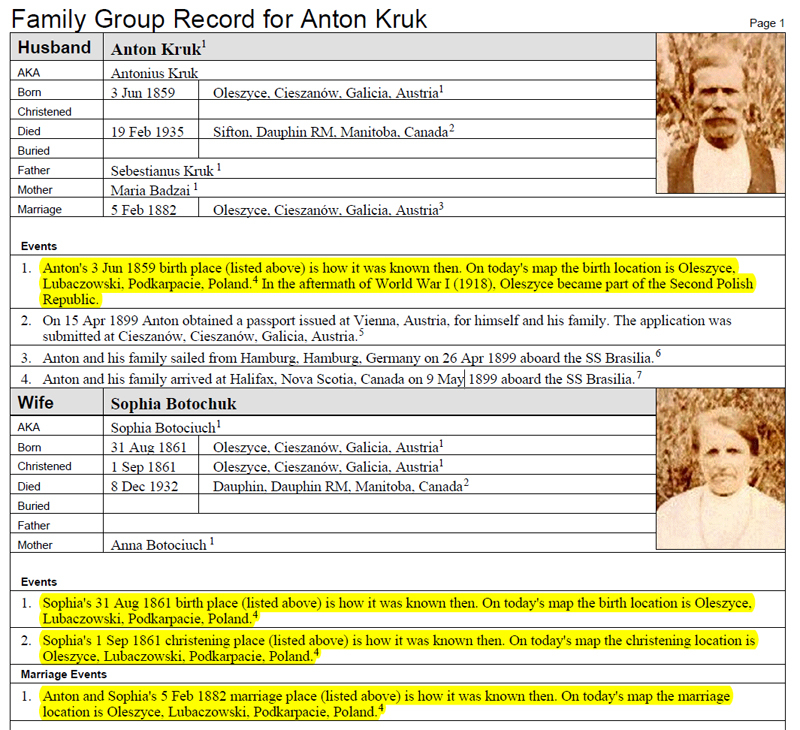 A cardinal rule of family history is to record a location as shown on the earliest record you have of the event. Many times the place where a birth took place is in a different county or province today and in some cases even in a different country! For example, a person may have been born in a town which is in Poland today, but the town may have been part of Austrian Galicia (or perhaps maybe Prussia) when the event took place. Boundary lines change over time in many parts of the United States as well as the rest of the world. However, boundary changes also affect whether or not Legacy can map a location. For example, if you record an 1859 birth as happening in “Oleszyce, Cieszanów, Galicia, Austria” Legacy's mapping feature will not find it because the current location is “Oleszyce, Lubaczowski, Podkarpacie, Poland.” A little Internet sleuthing with Google and other resources will help you determine the history of your location. After World War I, Oleszyce became part of Poland. To make this clear to others who see your research you can add a custom event named Current Location. By the way, you can copy the current location latitude and longitude into the historic location listed in your Master Location List so that it can now be mapped. See Mapping and getting the place right. 1. In the Individual's Information window click the Add button to open the Add Event screen. 2. 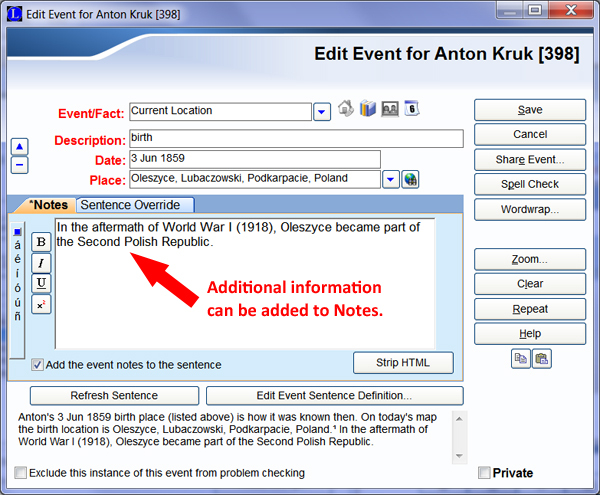 Create a new Event called Current Location by typing it into the Event/Fact field. Also add the Description (in lower case), Date and Place. 2. Next click the small blue down-arrow to open the Master Event Definition List. 3. At this point you will want to create a sentence, which when processed, results in the wording that will appear on reports. The sentence can contain [fields] and <conditional formulas>. Click the Edit button. By the way, the use of [CoupleFirstNames] will make the Current Location event applicable to marriages as well. 5. Next click the Save button. If you want more information about any of the above steps, click the Help button in whatever screen you have questions about. 6. Keep in mind that additional information can be added to Event Notes.